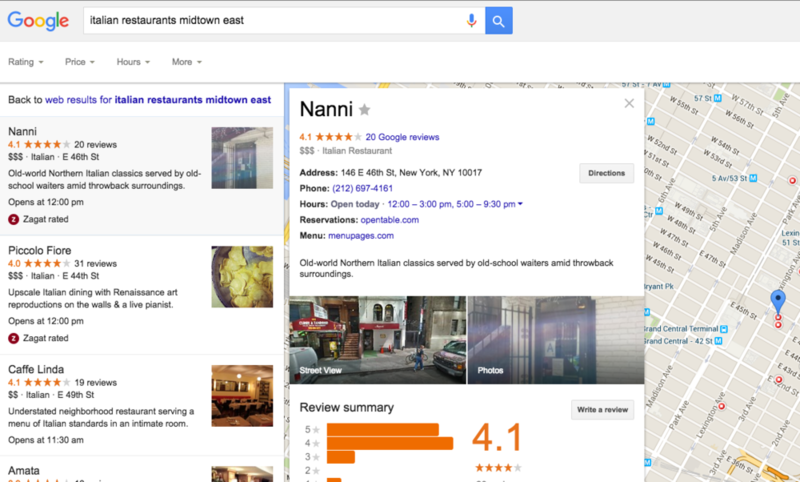 Once again, Google has changed the way their local listings appear. In the past, when someone would make a vague search, such as, ‘Italian restaurants financial district’ or ‘Italian restaurants midtown east’, 7 options would appear. These 7 options would come up as the first thing you see on a Google search results page, but would only show up 25% of the time. Now, they’ve reduced the number of local search results so that only 3 options appear. These 3 options appear as the first thing on your page, without having to scroll down, 93% of the time. This is important because users want information quickly and easily. When making a vague search, they want results as fast as possible, without having to dig for a viable selection. In the case of the search query examples above, I had the ability to find Italian restaurant names, near me, as soon as possible, without having to deal with clutter and other unwanted results. The new local 3-pack is also designed to keep searchers in Google’s knowledge graph longer, and provide them with all of the information they need without having to click through multiple pages – or even to a specific business’ website. If one of the first three listings looks appetizing, one click takes you to all of the information you need. The name, address, phone number, and menu are the first thing you see. To the right, you have the ability to access the restaurant’s website and get directions via Google maps. It is incredibly important for business owners to make sure their information on Google is accurate. Even if you have a great website, and had previously done SEO with that site, 93% of the time Google local listings will appear before your website. Google controls over 64% of the search engine market share, so having accurate information on Google, including your name, address, phone number, and menus, gives you a far better chance at earning business than having inconsistent or no information available at all.